A seventh man has been arrested in London in connection with the Financial Services Authority's (FSA) largest operation yet against insider dealing. The investigation is a joint venture between the FSA - the City's watchdog - and the Serious Organised Crime Agency. So far, none of the seven people arrested have been formally identified. On Tuesday, 16 addresses in London, the South East and Oxfordshire were raided and papers and computers were seized from homes and businesses. Three financial institutions are known to have workers caught up in the operation: hedge fund Moore Capital, leading German bank Deutsche Bank and Exane BNP, which is 50% owned by French bank BNP Paribas. 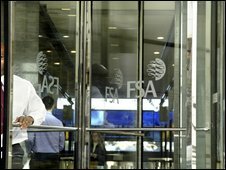 The FSA is probing private dealings by the traders, rather than trades for the firm. The companies say they are co-operating with the investigation. It is alleged the City professionals passed inside information to traders, either directly or via middlemen. The traders then allegedly acted on this information and made significant profits as a result. This latest operation is the fifth set of arrests carried out by the Financial Services Authority in connection with insider dealing in the past two years.